A 10-inch LED light bar is often a buyer’s first LED light bar purchase. Even a single one, grill-mounted, typically outperforms a pair of conventional car high beams. A pair of 10-inchers with amber LEDs or an amber cover produce deeply penetrating, fog-killing beams when driving conditions turn treacherous. 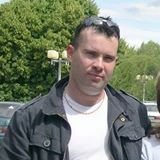 Their adaptability extends to just about any vehicle you can imagine from ATVs to tractors to 4x4s and so many more including boats and heavy equipment. The following detailed reviews will help you choose the best 10 inch LED light bar for any application you desire and any lighting budget. Black Oak’s 10 inch LED light bar is their biggest seller. Bracket to bracket, its 13-inch overall length fits a multitude of locations on any 4×4, UTV, ATV, tractor, truck or car. It features an outstanding IP69K intrusion rating that stand up to whatever the trail dishes out. Up to 550 raw lumens per OSRAM LED make this the brightest and most efficient light bar money can buy. Black Oak’s D-Series is built to survive extreme conditions with a rugged housing and highest possible intrusion rating. Add optional amber covers to slice through fog and mist or rack mount them for use as flood lights at work sites. Many buyers mount two, front and back, on an ATV/UTV to brighten dark trails and to enhance vehicle visibility. 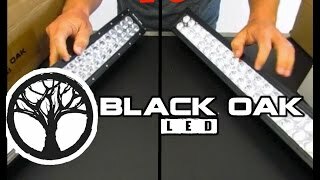 Black Oak is establishing a reputation as the highest quality LED light bar maker with value pricing. Their 10-inch D-Series light bar is the perfect combination of high performance and an affordable price. Buy with confidence a light bar that can take punishment while outputting the most light for your money. 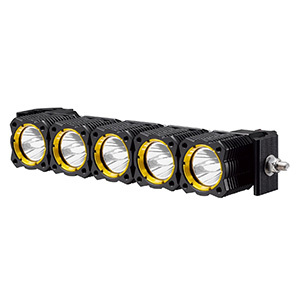 Baja Design’s OnX6 10 inch LED light bar delivers an impressive 6,450 lumens from six CREE XM-L2 LEDs. High Speed Spot™ reflector technology produces one of the longest spot beams in the world. A hard anodized aluminum housing , polycarbonate lens and IP69K intrusion rating let you use it, abuse it and drive away the darkness as well as light bars twice its price. 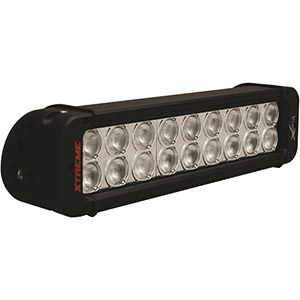 This OnX6 light bar uses light projection technology developed for Baja Designs’ racing light bars. High quality circuitry and thermal management guarantee LED lifespans of 50,000 hours. This 10-inch powerhouse also features 5000K color temperature, which significantly reduces driver fatigue. All lenses and optics are individually replaceable, so repairs are easy and economical. There is no LED light bar on the market more robust than those from Baja Designs. Everything is overbuilt as you would expect from a company with over 20 years of experience in building lighting solutions for off-road racing. The 10-inch OnX6 outputs the brightest, most seamless beam of its size. Rigid’s next generation E2-Series features a more durable two-piece housing and increased LED cooling. The end-cap stainless steel mounting brackets on this 10 inch LED light bar model deliver vibration-free operation. The 5-degree center hyper-spot and 6-LED side sections throw a 900m beam that is also the cleanest, most efficient driving beam on the road. Rigid’s 10-inch dual-row E2-Series LED light bar uses patented Specter optics to add 50 percent more LEDs and a more efficient, void-free beam. It sports an impact-proof, extruded aluminum housing, durable polycarbonate lens and integrated LED cooling for long life and optimum performance. If you think the Hyperspot may be too intense, order the driving beam configuration instead. Rigid’s new 10-inch E2-Series light bar uses cleaner optics to produce a more penetrating and brighter spot than ever. This is a lifetime LED bar that comes with everything needed for a professional installation. Opt7 does not make a 10 inch LED light bar, but their 14-inch model is close enough. Twenty-four CREE X-BD LEDs put out 32 percent more light than their respectable C1 Series. Oversized heat sinks with milled fins keep the LEDs running cool for up to 50,000 hours. 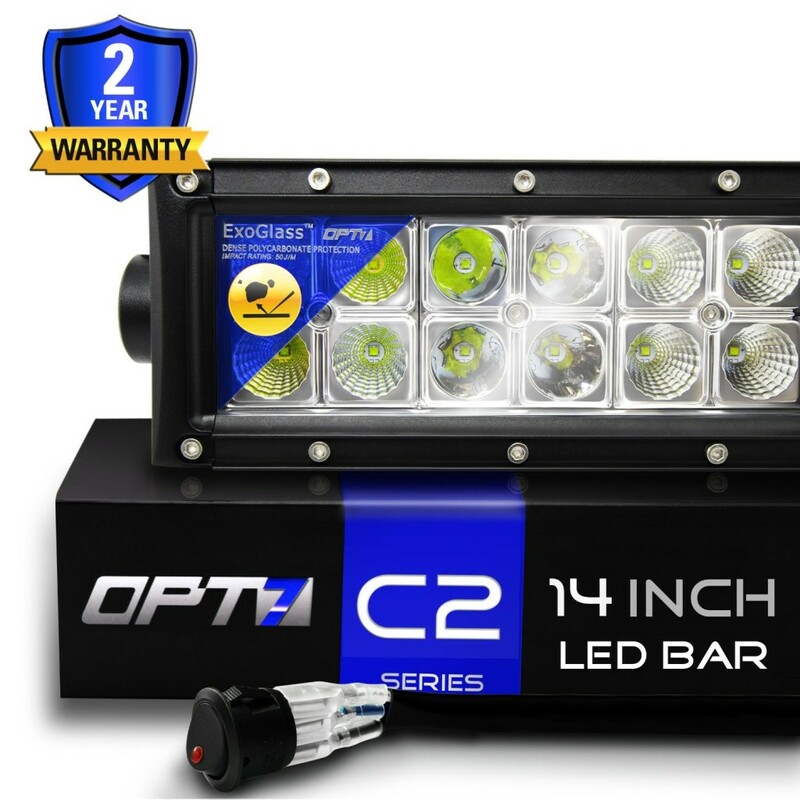 In either a flood/spot or spot configuration, the Opt7 C2 14-inch light bar puts out more light per dollar than any competitor and comes with a 2-year, free replacement warranty. This Opt7 C2-Series 14-inch model is barely longer than others’ “10 inch” light bars, has competitive specs and a bargain price. The C2 Series features superb cooling and extra clearance brackets. 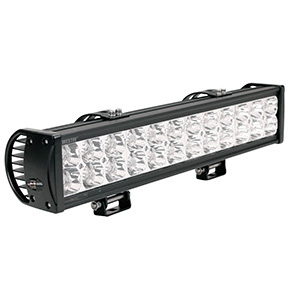 It is as bright as more expensive LED light bars with a slightly lower IP67 rating. If even a single LED burns out within two years, Opt7 replaces and ships a new bar for free. Opt7 products compete on performance and price. Build quality and beam optics are not quite up to, say, Rigid standards, but if you want to control your lighting budget but still achieve brightness C2 Series light bars are a terrific value. The Sirius 10 inch LED light bar is a mid-range flamethrower with unique optics. It uses 20 5W high quality, long-life LEDs in a dual-row configuration, which produces a 20-degree flood pattern via optimized, 94 percent efficient reflectors. It comes with a generous wiring hardness including a 12-foot cable, relay, fuse and dash switch. It featurs an IP68 intrusion rating and limited lifetime warranty. The Sirius 10-inch light bar is, as one buyer put it, “ludicrous bright.” Sirius has tuned the optics for a “tight flood” configuration across the bar, which delivers excellent penetration and wide driving beam. Its build and IP68 intrusion rating compare favorably with much higher-priced products. 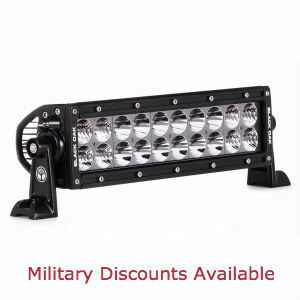 Sirius is quietly putting out excellent quality light bars at very affordable prices. 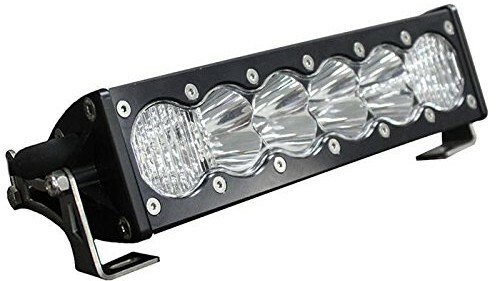 This 10-inch light bar has the performance and build quality nearing the top-rated competition but at a price sure to please budget-conscious buyers. 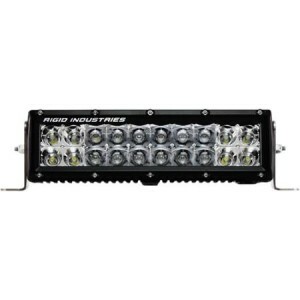 Ten-inch LED light bars are fast sellers for almost any LED light bar maker due to their lightweight, high light output and extreme versatility. They make an excellent “starter” light for those just getting into LED light bars and mount easily on any type of vehicle almost anywhere on that vehicle. They make excellent standalone work lights when tripod-mounted.